This photo was snapped by a bystander before firemen arrived. The mobile home is located at 246 Hemby Blvd. (off FM-2457). 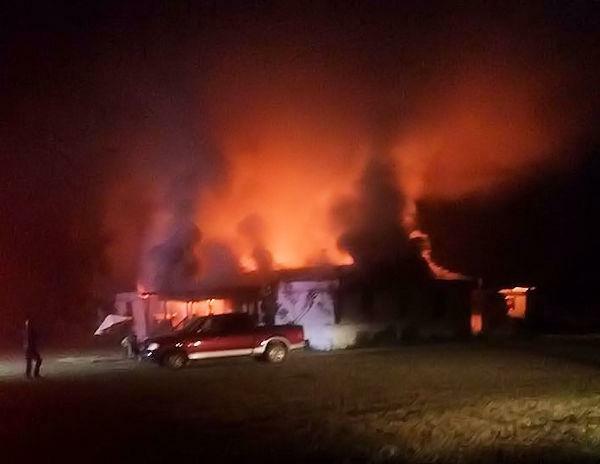 Mobile Home Fire Near FM-2457, BLANCHARD, July 30, 2015 - Shortly after 9 pm on July 29, 2015 neighbors reported a mobile home fire to the Polk County Sheriff's Office. Firemen from Livingston and Scenic Loop VFDs arrived at 246 Hemby Boulevard to find an older model mobile home burning. Additionally, Americare Ambulance Service was dispatched along with Deputy Victor White and Corporal Adam Norris (both with the Polk County Sheriff's Office). The home is reportedly owned by Bruce BeBee, 61, of Livingston. Nobody was home when the fire broke out. Firemen were able to put the fire out, but the mobile home is probably totaled. Fortunately, nobody was injured in the incident. It is not known to PolkCountyToday.com whether or not BeBee had homeowners insurance. The fire remains under investigation.